Compile materials taken from a variety of formats (Powerpoint, Word, PDF, JPG, audio, video, etc.) 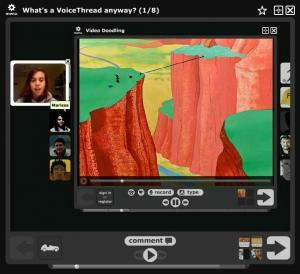 into a slide-based VoiceThread presentation right inside your course web site. Then, you and your students add comments to the slides using a microphone, webcam, or text. Think of VoiceThread as a richer alternative to discussion forums for when you want students to engage with specific images or other media. Or, use VoiceThread as a lecture tool in an online class and let your students ask questions right at the spot where they need help. For online courses especially, having your students speak and been seen contributes to the "humanizing" of the experience for everyone involved. All instructors and students at Stan State have free access to VoiceThread. Go to http://csustan.voicethread.com and click the "Sign In" link. Login with your regular university login name and password. Instructor accounts are automatically activated once the instructor logs in to csustan.voicethread.com or adds a VoiceThread activity to a Blackboard or Moodle course web site. Student accounts are automatically activated once the student interacts with a VoiceThread activity or logs in to csustan.voicethread.com. VoiceThread accounts "travel" with users through all of their courses, so you only use a single account for all your courses. The following web pages contain detailed instructions for students and instructors using VoiceThread as a commenter.